If Ironman Kona is the crown jewel in the crown of Ironman North American, then Ironman St. George is the dirty little secret. The race is unlike any other in the Ironman series — it is tough and gritty — and I think those who complete this race really have something to brag about. The swim is in super cold water, the bike is on a tough mountain course, and the marathon is on a super hilly course. This is not a race you can fake your way through. You can read additional detail about the race here. But here I want to discuss the swim. The swim and T1 are out at Sand Hollow Reservoir. 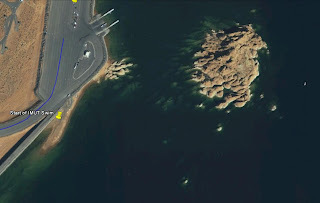 If you head out to Sand Hollow for a scouting trip, they set T1 up in the boat parking and the start of the swim is where I have the pin marked in the graphic (isn’t Google Earth sweet?). The exit is on the boat ramp and since this is an IMNA event, the exit is carpeted so you don’t tear up your feet. I can’t say the same about the entry. The course is simple, you head out to the southeast from the start. There are a couple of turns here, and a couple of turns there. The great thing about this course is you never have to sight into the sun. I am color blind so sighting off of buoys is tough because most colors will blend into the scenery. But once you turn north you swim to the east side of the island you see in the picture. Once you turn left around it, you swim straight for the ramp. IMNA has their huge archway sitting next to the exit, so you can see the exit easily. I think this swim course is one of the easier that I have ever done. This swim is just like any other Ironman swim — it is 2.4 miles of swimming. There are no shortcuts. But there is one thing that really makes this course tough, the water temperature. Officially the water temps at the beginning of May at the Sand Hollow Reservoir fall into the 60-65 degree range. On race day in 2010 they were closer to 55-58 degrees. Lots of people were pulled from the water for hypothermia. The water temps are not something you can just “get through”, so you need to plan for them. Buy yourself a good wetsuit. Here is my review of the DeSoto I wore last year. I know this one is not going to allow you to qualify for Kona, so check the rules for 2011. I also bought a set of neoprene boots that weren’t too expense just in case I lost them. I purchased a neoprene swim cap too. I wore both during the swim warm-up the day before and was just fine. During the race I was never too hot and was really, really glad I had on both. My feet and head stayed warm and I was able to focus on my stroke instead of freaking out about my body temperature.